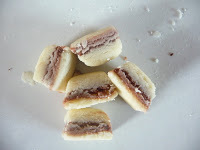 Ever wondered how to make your own dolly mixtures? I had never wondered that before yesterday, but on my lunchbreak, I went for a nice healthy walk and ended up buying some not quite so healthy dolly mixtures. To be fair they didn’t cost very much – around 40p for a supermarket own brand packet, but I didn’t like some of the ingredients in them and the plastic bag it came in wasn’t recyclable. Junk food is never going to be good for me, I can’t get away from that fact, however rather than giving up entirely and thinking oh well it is junk food, which isn’t good for me anyway, actually it is still going to be better for me (better ingredients) and the environment (less packaging) to make them myself. It is probably slightly cheaper for the quality of the product as well. So when I got home from work, I just had to have a go at making them myself (not all of the mix, just the type shown in the picture above). They were so easy to make, they would be a great activity to do with kids (if they are going to eat sweets anyway, why not show them how they are made and explain to them about sugar and their teeth along the way)! 1. Mix all the ingredients together in a bowl except for the cocoa. 2. Form a solid ball and then split it into two. 5. 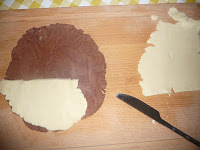 Cut each bit in half and layer the colours -white, brown, white and brown, white, brown. 6. 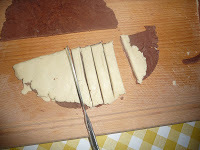 Cut into strips and then into cubes. 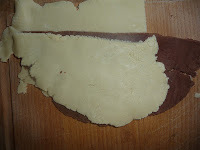 It took me around 20-30 minutes to do and tasted ok. 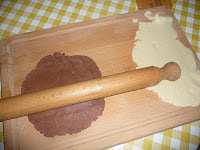 I actually used rapeseed oil and normal flour for the ones shown here, which wasn’t so good, but the next day I made a little of the mixture again with a very light flavoured olive oil and cornflour and it tasted a lot like a dolly mixture sweet! Next time I am going to add a few peppermint drops to the mix and have peppermint flavoured versions! 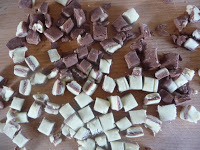 This is my first attempt at making dolly mixtures, so I’m sure the recipe could do with a bit of tinkering. I would love to hear your dolly mixture recipes. What do you think? Will you give dolly mixture making a go? If you liked this post, I would really appreciate it if you click like on Facebook and follow on Twitter. Also if you have a Kindle it would really make my day if you subscribe to this blog on it! – Thanks! This entry was tagged dolly mixture, Food, homemade, recipe, sweets, thrifty. Bookmark the permalink. ← The best Banana Tea Bread ever! Oooo these are genius! I'm going to give these a go! 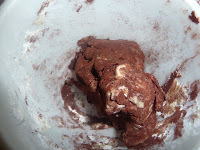 I can never find vegan dolly mixtures, I never thought to make my own! 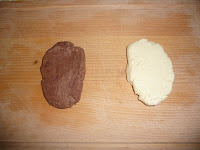 I would love to hear how yours turn out Sooz and any suggestions you have to improve the recipe would be great!